Berlin-based Dixon headlines the event with a three-hour set. Building his name and playing his craft for over two decades, he has possibly gained the status of one of the world’s foremost figures in electronic music. Poised to make his Renaissance debut, the Innervisions’ boss also marks a rare Birmingham appearance when he brings his brand of minimalistic house and techno to the city. Support on the night comes from Innervisions’ regular Trikk, as the Portuguese musician lines up a big 2019. 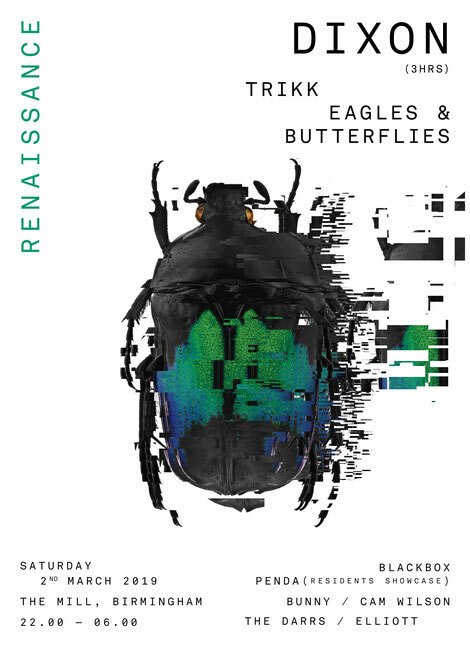 DJ/producer, Eagles & Butterflies also joins the line-up in his hometown, following on from his promo mix for Renaissance. In Room Two, Blackbox returns to Birmingham since its closure in 2018 with original sound and lighting intact and is set to be hosted by PENDA; Birmingham's grass roots brand, bringing a residents showcase of local talent. Historically, Renaissance established a reputation as a club brand and record label. Having released more than 200 compilations and singles, the label has a back-catalogue that probably boasts a who’s who of established artists. Recently, the 'ReMix Collection’ series of remixes has seen consecutive Beatport Top 100 No.1’s for Renaissance with Solomun, Tale Of Us and Maceo Plex delivering some of the biggest tracks of the last year on the label.